Elvis People are a diverse group of people whose lives have been touched by ‘The King.’ Share with the world how you have been touched, by filling out our Submission form. The sights and sounds of Elvis Presley permeated my home and countless others while I was growing up. His voice, his music and his movies were a backdrop to American life and culture, and in so many ways still is. Elvis is an undeniable part of my life. Producer of nine of Elvis' films. Review of Elvis’ Las Vegas engagement. President Jimmy Carter, 1977. His official statement following Elvis' death. “I wasn’t just a fan, I was his brother. He said I was good and I said he was good; we never argued about that. Elvis was a hard worker, dedicated, and God loved him. Last time I saw him was at Graceland. We sang Old Blind Barnabus together, a gospel song. I love him and hope to see him in heaven. There’ll never be another like that soul brother." "I remember Elvis as a young man hanging around the Sun studios. Even then, I knew this kid had a tremendous talent. He was a dynamic young boy. His phraseology, his way of looking at a song, was as unique as Sinatra's. I was a tremendous fan, and had Elvis lived, there would have been no end to his inventiveness." I'm sitting in the drive-through and I've got my three girls in the back and this station comes on and it's playing "Jailhouse Rock," the original version, and my girls are jumping up and down, going nuts. I'm looking around at them and they've heard Dad's music all the time and I don't see that out of them. When I first heard Elvis' voice, I just knew that I wasn't going to work for anybody, and nobody was going to be my boss. He is the deity supreme of rock and roll religion as it exists in today's form. Hearing him for the first time was like busting out of jail. I thank God for Elvis Presley. "Elvis Presley is like the 'Big Bang' of Rock 'n' Roll. It all came from there and what you had in Elvis Presley is a very interesting moment because, really, to be pretentious about it for a minute, you had two cultures colliding there. You had a kind of white, European culture and an African culture coming together - the rhythm, okay, of black music and the melody chord progressions of white music - just all came together in that kind of spastic dance of his. That was the moment. That's really it. Out of all that came the Beatles and the Stones, but you can't underestimate what happened. It does get back to Elvis." "The first concert I attended was an Elvis concert when I was eleven. Even at that age he made me realize the tremendous effect a performer could have on an audience." "I'm just a singer, Elvis was the embodiment of the whole American culture." "He epitomized America, and for that we shall be eternally grateful. There will never be anyone else like him. Let's all rejoice in his music." "If life was fair, Elvis would be alive and all the impersonators would be dead." "Elvis Presley was the first and the best. He is my favorite of all time." "I love his music because he was my generation. But then again, Elvis is everyone's generation, and he always will be." Sign me up today for the latest news on Elvis People: A New Comedy, including special promotions, ticket giveaways and events. 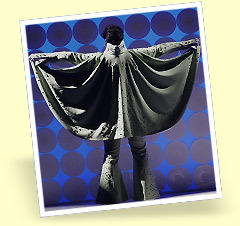 "Elvis People: A New Comedy" tells the story of the King, using the man's funny and familiar mythology as a lens to view the latter half of the twentieth century. With themes ranging from sensuality to loneliness, greed to obsession, ice cream to yogurt, this hilarious comedy takes you through American pop culture as it reveals the legacy of Elvis in the lives of people who worshiped him, served him, exploited him and wanted to be him. 84% of Americans claim Elvis Presley has affected their lives in some way: "Elvis People-A New Comedy" introduces you to some of those people. © 2007 E.P. Productions Inc. Performance of this work does not imply affiliation with nor approval or endorsement of Elvis Presley Enterprises. All events and people depicted in this work are fictional and any resemblance of fact is coincidental.